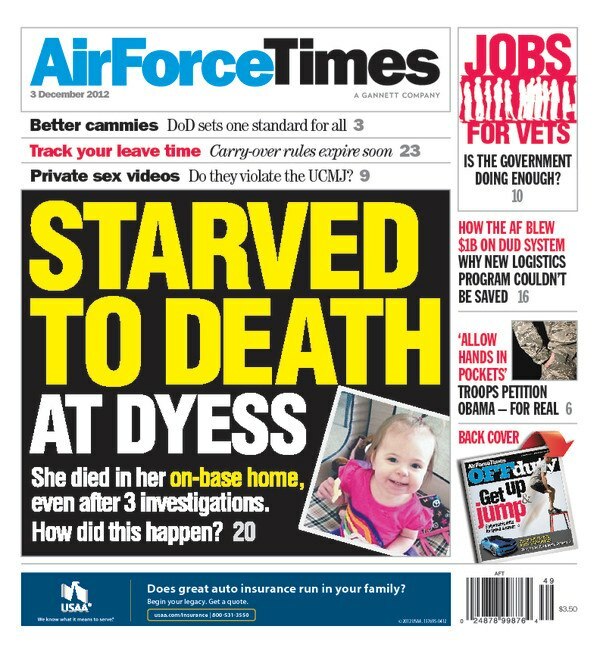 By the time 22-month-old Tamryn Klapheke died in her own excrement at her home in Dyess Air Force Base, Texas, Child Protective Services had closed three neglect investigations into her family – the last one was closed less than a week before her death. Read how Tamryn’s case shows that Air Force efforts to stop child abuse are hamstrung by poor coordination among those who are supposed to protect children – all of whom failed this little girl. In the world of dollars and cents, the Air Force has canceled a $1 billion logistical management system to avoid wasting another $1 billion on a program that has been plagued by technical glitches and delays. The Expeditionary Combat Support System would not have been ready to be fielded until 2020, by which time it would only have been able to deliver a quarter of the capacity originally planned. Meanwhile, the head of Air Mobility Command said the Air Force will have to do less as defense spending shrinks. “The last thing that we want to do is say that we can do all these things and in reality we can’t,” Gen. Ray Johns Jr. told Air Force Times in a Nov. 20 interview. And F-22 flight operations at Tyndall Air Force Base, Fla., have returned to normal after the Nov. 19 crash of one of the aircraft in a wooded area near the base. There are currently no indications that the crash is related to problems with the F-22’s oxygen system, a spokesman for Air Combat Command said.